I love it when someone reaches out to me with a question about sweater knits -- either about making them or sewing them. And if I don't have the answer, there are usually a couple people I can ask, who can provide an answer or at least give a suggestion that will lead the inquirer in a good direction. I feel that I end up learning when someone asks a good question, even if I thought I already knew the answer. The act of composing an answer makes me organize my thoughts. I also think about the process or situation a little more carefully and with a different point of view. I'm inspired to try new things. The question I get asked most often is, "What's a good sewing pattern to use with sweater knits?" I used to not have an answer, because I didn't use commercial sewing patterns. In the old days, all the sweaters I made were fully fashioned; that is, I used to shape each piece on the knitting machine as I constructed the fabric, analogous to the way a hand knitter makes pieces of a sweater. 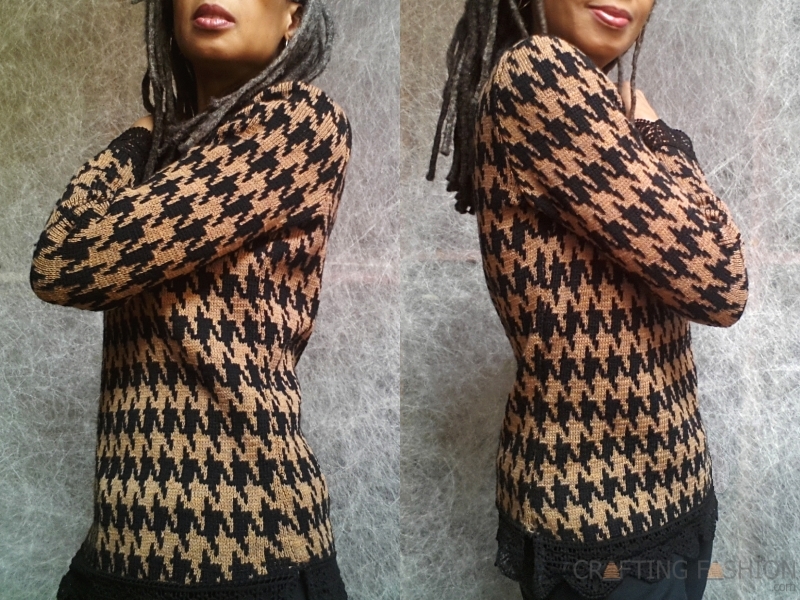 When I started making sweaters with the cut and sew method, I simply used my own pattern blocks, either freshly drafted or traced from an old sweater or t-shirt. I'd start my answer to the question with another question. "Do you have a t-shirt pattern?" I'd ask. "You can use that," I'd say. And if a t-shirt has a fit you'd like for a sweater with deep enough armholes, it can work. Back in 2013 I was asked that question so often, I thought I'd better try a sweater knit with a commercial t-shirt pattern and see how I really liked it. In 2013, there were no Toasters or Tabors to recommend. There were no Megans or Blackwoods. The first commercial pattern I ever used for a sweater was indeed a t-shirt pattern, Sewaholic's Renfrew Top, pictured at the top of this post. Why I chose a pattern company that catered to the "pear-shaped woman", when I'm more of a rectangle, I don't know. But it was the #1 pattern of the year on Pattern Review at the time when I was looking for a pattern. I felt confident that I could easily alter the pattern to fit me, which I did. I also made another change to the pattern. I'll get to that one in a moment. What was important was that when someone asked me for a recommendation, I could recommend from personal experience. Debbie of Lily Sage & Co sews a Megan Cardigan in O! Jolly fabric, definitely not a t-shirt sewing pattern! Here's the important part: true sweater knits can vary greatly. One sweater knit is not necessarily just like another. That's why sometimes your neckband can look a little wonky, even though you followed the pattern instructions correctly, and last time (with a different fabric), it was perfect. This variety in fabric behavior is what makes fabrics forever interesting and fun. And challenging. But readily managed. Please keep reading. Yes, there are many commercial sewing patterns from the majors and independents that are suitable for sweater knits -- t-shirt patterns, sweatshirt patterns, and now more than ever, patterns written specifically for sweater knits, both pullovers and cardigans. Sometimes, depending on your particular fabric, a few good decisions and tiny tweaks can make your sweater, even better. If I had to choose my favorite tweak I make to commercial pullover patterns, it would be the get-your-neckband-to-lie-flat-every-time tweak. It's the same technique I used when making the Renfrew. It's a matter of going "off pattern" just a little to determine a good length and width for the band for the fabric you're using. Then you can go back to the pattern, following the instructions for neckband installation. Easy. I've put together a group of five more tips that will help you sew a better sweater and made the list available as a free download. If you're interested in diving more deeply into the art of sweater sewing, be sure to join the list to learn about my online course How To Cut and Sew a Sweater. Download 5 Tips for Using Commercial Patterns with Sweater Knits now.